Mr. Todd Lalonde, Trustee for City of Cornwall and Glengarry County, has been acclaimed to the position of Chair for the Catholic District School Board of Eastern Ontario at the Inaugural Board Meeting held on December 4, 2018. It will be the third term as Chair for Mr. Lalonde, who is entering his thirteenth year as a Catholic school board trustee. Chair Lalonde welcomed newly acclaimed Trustee for Lanark County, Jennifer Cooney. 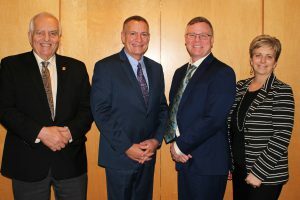 City of Cornwall and Glengarry County Trustee Ron Eamer was re-elected during the annual meeting to the position of Vice-Chair of the Board. Mr. Eamer has served as CDSBEO trustee since 1981, and has served terms as both Chair and Vice-Chair. The Board welcomed Archbishop Brendan O’Brien of the Kingston Archdiocese, who presided at mass to begin the evening. Archbishop O’Brien offered his thanks to trustees and senior administration for the work they do to preserve and protect their Catholic faith and Catholic education.